The king is an old man with arthritis and that is why he can only move one small step at a time. The bishop got cracked on the head by the queen and hasn't been able to walk in a straight line since. The knight can jump even higher than Michael Jordan and the pawn is simply a wimp. This is how first graders at Ole Hanson Elementary School have learned to play chess. "The pawn is the wimpiest guy and has been told that he can't turn around and run home to mommy when the battle starts," said chess teacher Eric Hicks. Hicks, 26, a resident of San Clemente, said chess has changed his life. He dropped out of high school when he was 17. But because of chess, he said, he was able to go on and graduate from University of California, Berkeley with honors. "I dropped out of high school and started playing chess in the beaches of Santa Monica," Hicks said. "I played against doctors and lawyers, educated people who seemed far above me. "But I was winning tournament after tournament and was being recognized for my skills, " Hicks said. "My G.P.A. in high school was 1.4 and I was a far from special as they come. But chess made me special. Chess gave me the push that I needed to go back to school." 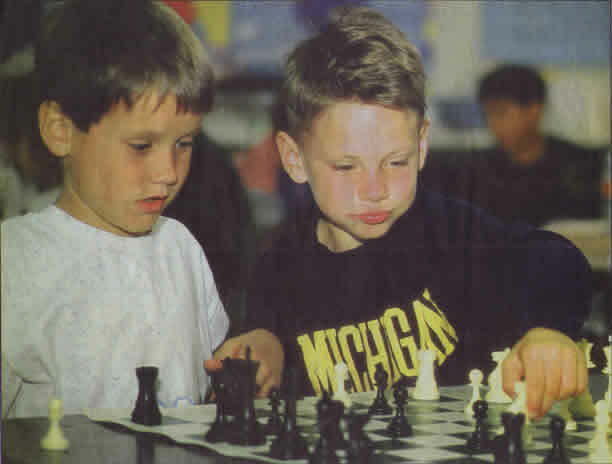 Because of his success with chess, Hicks has vowed to teach every student in the Capistrano Unified School District from kindergarten to high school how to play. He has started after school chess programs at most of the elementary school in San Clemente as well as at Barcelona Hills and Carl Hankey elementary school in Mission Viejo. "I realized that chess was like a godsend and was so incredibly fulfilling for me," Hicks said. "I wanted to share that with other students. 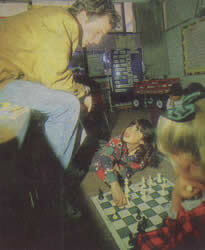 "At the schools in San Clemente, chess is more popular than pogs," Hicks said. "The kids all talk about it and are constantly playing it and it almost brings tears to my eyes to see the kids enjoying it." Last week he was teaching a combination first-and second-grad class at Ole Hanson in San Clemente. His next stop will be in elementary schools in Dana Point. "They are definitely the hardest classes to teach but it can be done," Hicks said. "But they catch on quick." Teacher Jill McDonald said chess teaches students valuable lessons about sportsmanship and helps improve math, critical thinking and problem-solving skills. "Eric has really brought chess down to their level of understanding," McDonald said. "The kids love it and I have already seen that it has made a difference with the students. In fact, one of my most challenged students is the most enthusiastic about this new program." Second-graders Megan Farley and Brittaney Wilcox sat cross-legged on the carpet and stared at the board in front of them. Farley slowly picked up a pawn and moved it forward. Wilcox squealed with delight as she made her move and took her opponent's pawn. "It's hard because the pawn can only move forward," Farley said. "He can't move back so a lot of the time he gets bonked by another piece and gets knocked of the board." At a nearby table second-graders Blaine Sibby and David Dill were in the middle of a game. Sibby claimed he was winning. "I have your pawns, your knight, and your king." Sibby told Dill. "And here comes my wimpy pawn to take your wimpy pawn and then I'll have more than you do." The boys made comic-book sound effects as their pieces bombarded each other on the board. Although they were still learning how to play, each was quick to remind the other of the rules when one of them made a wrong move. "The hard part is how to move the knight because he moves like an 'L'," Dill said. "Sometimes Blaine forgets that." Sibby pounded triumphantly on the table as he made his final move. He claimed himself the winner and knocked Dill's king over. "I won," Sibby said, pointing to the defeated king lying on the board. "I love this game. It's much better than checkers and now I can teach my little brother.